Lecturers can create, manage and share academic content, upload assignments which can be accessed by students anytime, anywhere and on any device! Colleges can take courses online and increase student reach by offering online courses and distance education modules. Ideal for colleges who want to integrate technology with pedagogy in keeping with the high standards of teaching traditions they uphold. Colleges can make their courses fully online and increase their reach by offering online courses and distance education modules. Document Management: Upload and management of documents containing content. Lecturers can easily adapt and reuse materials. Course calendars: Creation and publication of course schedules, deadlines and tests which can be communicated to students/parents automatically. Registration Control: Administrators can monitor and customize the registration processes of the e learning curriculum. 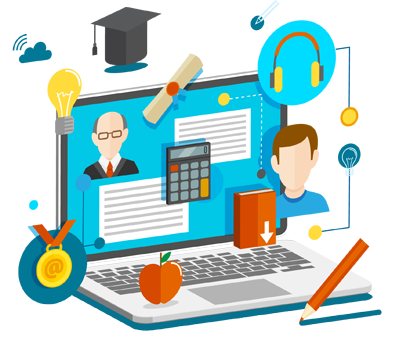 Distributed instructor and student base: Remote participation by the instructor or pupil allows courseware to feature multiple teachers or experts from across the globe. Student Engagement: Teachers can engage students with visual media and digital content. In addition interaction between and among students, such as instant messaging, email, and discussion forums. Assessment and testing: Creation of varied knowledge retention exercises such as short quizzes and comprehensive assessments and exams.Grading and Scoring: Advanced tracking and charting of student performance over time. Multiple device access: Delivery of course content over web-based interfaces such as desktops, phones or tablets. MOLE can reduce the burden of paperwork on Lecturers and leave with them sufficient time to innovate and teach. Lecturers can engage students with visual media and digital content. Let's face facts...cellphones and tablets and gadgets are here to stay and Lecturers can use these effectively in the classroom and incorporate international classroom collaboration, take part in global competitions and so much more. Copyright © 2019 MyPal Online School. All Rights Reserved. Hosted By Wifi4india Internet Services LLC.